Charles Augustus Converse (1815–1901) was co-founder of the Norwich-based Hopkins & Allen Arms Co. (1868), which became the third-largest gun maker in the U.S. after Colt of Hartford and Winchester of New Haven. 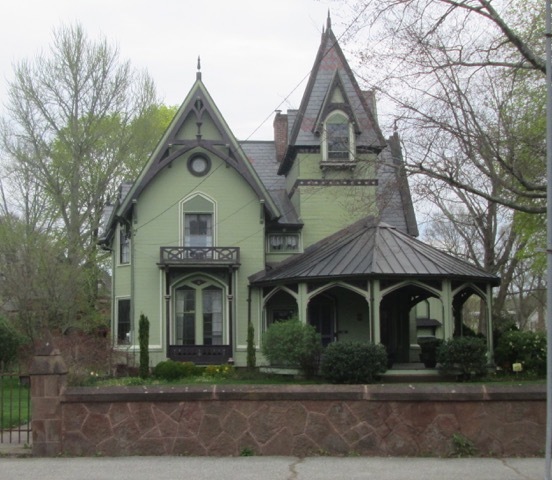 A superb example of the Gothic Revival style, the house and matching carriage barn were built by Charles and his wife Caroline Balcam Converse shortly after the Civil War, reveal the couple’s aspirations to fashion. Pointed (Gothic) arches, rooftop crockets, and elaborate gable decorations epitomized the Victorian penchant for the unusual and exotic. The Converses funded the Converse Art Building, added to the Slater Memorial Museum in 1906 (#3).